To order a printed copy of the Visit Llandudno brochure, simply click the Request button below. You can download the Visit Llandudno Brochure instantly as a digital iBrochure [?]. View the Visit Llandudno Online Brochure Now! Start at the tip of Llandudno's retro pier and travel into the timeless hills and mountains of Snowdonia, and you’ll come across everything from Punch and Judy to world-class contemporary art, one-of-a-kind outdoor experiences (inland surfing anyone?) to, robust castles, exciting new attractions to old favourites. Stay at snazzy, stylish seafront hotels (we have the best choice in Wales) or characterful country boltholes. Eat at bistros and restaurants serving fresh, succulent local produce. Dip into a vibrant night-time entertainment scene at theatres, pubs and clubs - and don't miss our fabulous line-up of events. Take your time to discover it all. This part of Wales welcomes visitors throughout the year. Springtime strolls along Llandudno’s immaculate promenade and Christmas shopping in Betws-y-Coed bookend a thriving all-season scene. For the full picture, download or order your copy of the brochure now. Visit Llandudno Brochure Bridget B. said: been there its nice , may go again sometime. 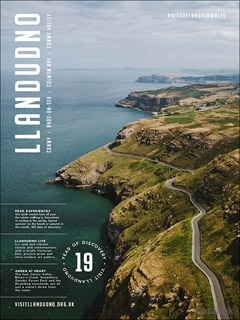 Visit Llandudno Brochure Sue M. said: Nice and informative with loads to do listed. Visit Llandudno Brochure Martin B. said: A LOT OF INFORMATION FOR ME TO MAKE A CHOICE IN THE FUTURE. Visit Llandudno Brochure Danielle M. said: Very exciting places to visit in this one. Love Llandudno. Visit Llandudno Brochure MICHELLE D. said: quick, no hassle service. Visit Llandudno Brochure Gail W. said: I am definitely going to use this brochure to book my familys summer holiday this year. It's the start of the Easter weekend! Check out all the Easter activities happening in Conwy County this weekend! By pressing the Request Printed Brochure button you give consent to Visit Llandudno (and their Data Processors for the specific purpose of delivering your literature) to send you their Brochure .